How Do I Use Send a Fax? You can send a fax directly from our site using a browser anywhere in the world. 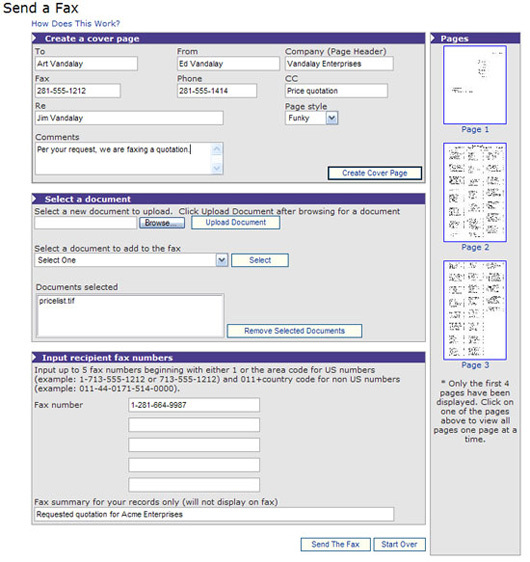 Simply type in data in the optional cover page, select a document, input a fax number, and send it. It couldn't be easier. If you desire to have a cover page, fill in the details in the Create a cover page section. The system will save all of your cover page information so you do not have to re-type your information each time you need a cover page. Once you have input this information, click on Create Cover Page. The system will take a few moments to create your cover page. When it is done, you will see your cover page appear in the Pages section on the right hand side of the screen. If you just want to send a cover page, simply jump to step 3. Select a document either by uploading a new one that our system supports or choose an existing document that you have uploaded previously. Supported document types. If you choose to upload a document, click on Browse and select a file from your local hard drive. Once selected, click on Upload Document. The system will now take a few moments to transfer and prepare your document. When completed, you will see the first few pages of your document in the Pages section. If you have previously uploaded a document you would like to use, click on the list where it says "Select One" and then click on the document name that you desire. If you have quite a few documents, you may need to scroll down the list looking for it. Upon selecting your document, the system will prepare your document and the first few pages will appear in the Pages section. Enter up to 5 fax numbers for the recipients of this fax. You should format the numbers beginning with 1 for US numbers (example: 1-713-555-1212) and 011+country code for non US numbers (example: 011-44-0171-514-0000). In this section, you can also enter a summary of this fax for your records. This will appear in the Statements section of the site but will not appear on the sent fax. Click on Send the Fax. At anytime you can click on Start Over to clear out the Pages and data you have input. However, your default information in the Cover Page section will still remain. "FlatRateFax.com has improved my business, because I have cut down on paper faxes, and I can send and receive faxes from anywhere in the world.....all I need is my laptop!" "FlatRateFax has been extremely cost effective and convenient. After 3 months of use, I have saved an average of $98.00 a month. I no longer require a second phone line. I don’t waste paper from all of the unwanted faxes my company receives, not to mention, the fax cartridges not being wasted. I never miss an important fax because my email travels with me on my phone when I leave the office. FlatRateFax has proven to be a good business decision!"